Originally from Nashville, TN, this week’s client moved to Largo, Florida in 1999, and purchased his current home in 2006. Mr. Wall and his Girlfriend reached out to International Granite and Stone in early January this year about updating their corner Kitchen. Designer Elizabeth W. came out to the home, with Cambria Quartz samples in hand to help find the perfect color for the Wall’s Kitchen. Life in Largo Happens in the Kitchen. From getting kids ready for school in the mornings and making lunches, to settling down for a good night’s dinner, your Kitchen sees a lot of wear and tear on a daily basis. Complete Kitchen Remodels are a popular home renovation project that can vastly increase the appearance and perception of the space. The right kitchen layout, with ample amounts of Countertop Space has become a staple in most Kitchens today. The Cabinetry and Appliances in the Wall Kitchen were in good enough condition to keep, but the Countertops and Backsplash we’re not to their liking and wanted a change. They knew they wanted a light colored countertop, but something different, with some pizzaz. With Elizabeth’s help, the client’s chose Cambria Oakmoor Quartz, a light sandy beige color, with waves of motion throughout the piece. Cambria Quartz is known for its exceptional impermeability to stains, as well as their high quality material and vast color displays. For the Backsplash, the customers had a difference of opinion on what type of tile style to choose. The decision came down to Subway Tile or an Interlocking Pattern. After the immense success of their Kitchen Countertop Project, the Wall’s went ahead and scheduled a Consultation to see about redoing their two and a half bathrooms. The couple wanted to do something different from their Kitchen for their Bathrooms, that would also tie into the color palettes they already used throughout the home. In the Master Bath, the Wall’s used two circular under mount sinks, with Cambria Berwyn Quartz. They mounted two singular mirrors to the wall, giving it a sleek chrome look. The Second Bathroom, they also used a circular sink. 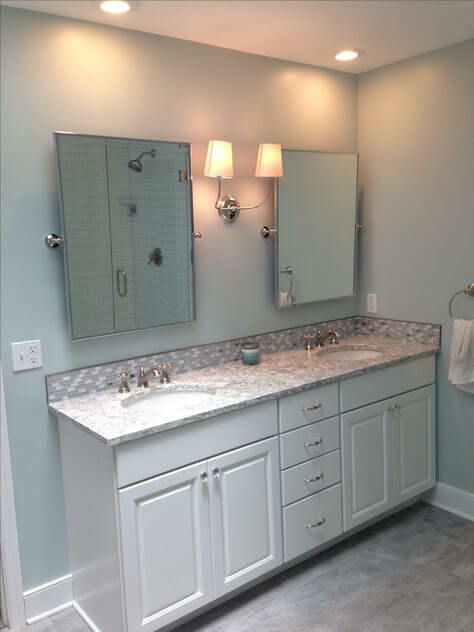 For both of these bathrooms, the owners used 5 inches of backsplash tile to create a border around the vanities. In the Half Bath, the couple used the same Cambria Quartz, but switched things up to a modern square under mount sink, to give guests a little bit of extra flair while in their bathroom. With an In-Home Appointment and Elizabeth W.’s Help, The Wall Family Chose Cambria Oakmoor Quartz, for Its Immense Durability and Low Maintenance. 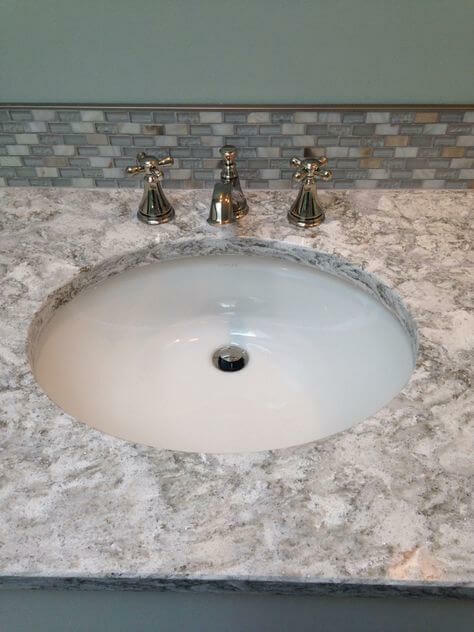 Cambria Quartz Is an American Made Quartz Brand out Of Le Sueur, Minnesota. Buy with Confidence; Quartz Countertops Stain Resistant and Scratch Resistant, and Never Requires Sealer, Unlike Granite or Marble. A sealant is an additional cost you can avoid with Quartz. The Lighter Colors Are Preferred to Customers Because of Cambria’s Lifetime Warranty against Stains and Scratches. Cambria Oakmoor Is a Part of Cambria’s Oceanic Collection. The Customer Also Chose Interlocking Tile for The Backsplash to Complement the Quartz and To Protect the Walls from Stains.